Fasttac provides complete information regarding the facility or project by organizing 2D drawings, in a 3D grid, and using our patented navigation to move between trade drawings. We combine this with the ability to view and record information at any location, ensuring that information gets to the person who needs it, when they need it, where they need it. Design Grid, Shop Grid, Design Details, Shop Details, all organized by drawing sticks. One project, one database. All project information is in a single database. 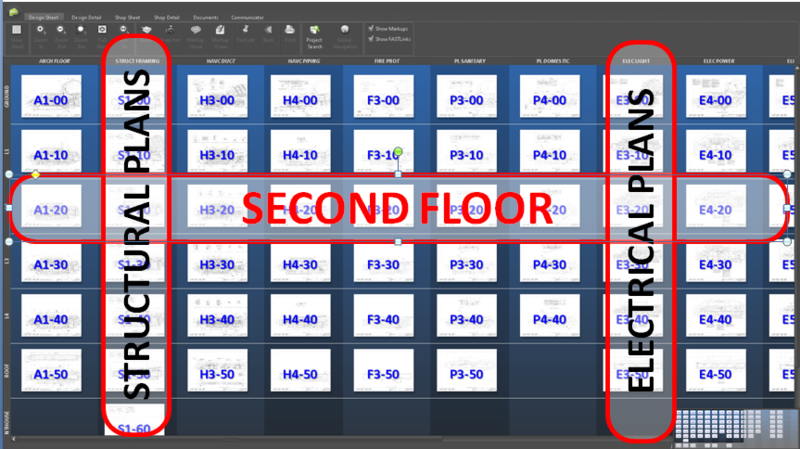 Our patented Grid View allows you to navigate your 2D drawings in a 3D grid, organized by floor and trade. Organizing your 2D drawings in a 3D manner allows you to quickly navigate between floors and trades. While navigating from floor-to-floor, or trade-to-trade, our same spot same zoom technology keeps you looking at the same location of the drawing. Going from drawing to drawing or document to document is just as intuitive as paper sets and much more efficient. Easily move around to find what you need as fast as possible. Attaching information to specific locations of your drawings is critical for accuracy and efficiency. Fasttac allows you to add information privately for your personal use, or public for your entire team to see. Add a markup layer (free draw or a cloud of any shape)to your drawing without actually changing the drawing itself. 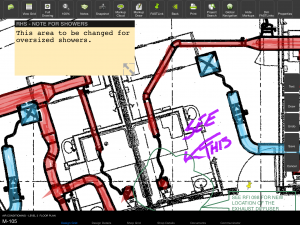 Attach a note to any drawing location to record information, bookmark a location, collaborate with others, and much more. Link a location of your drawing to anything: other drawings, documents, web pages, manuals, videos, and more! Updating paper drawings doesn’t allow you to track changes in a secure and scalable way. This makes it almost impossible to audit and discover exactly when changes were made and exactly who made them. Fasttac takes the gray out of discovery by allowing you to see exactly what change was made, who made the change, and when it was made. Our software provides version control and auditing for all changes to content and users. Having all of your important information organized in a meaningful way helps your staff find the information they need when they need it. Unfortunately, the information that you have isn’t all the same file type. 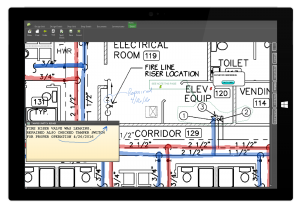 Fasttac allows you to link your drawings directly to any document or file. Link a specific location of your drawing to warranty information, manuals, work orders, forms, pictures, videos, websites, and more. Adding markups and information can quickly create a lot layers of information. This can convolute the drawing if all of the content is the same color and size, making it hard to disguise each markup. Fasttac allows you to use 16 different colors, 3 pen widths, and has a highlighter mode, allowing you to add many layers of information while keeping it easy to view and understand.